Servando: This is a featured post by Lucas Lee-Tyson. Since we recently published an article about the best print on demand sites to get started with eCommerce Lucas contacted me to write a Facebook eCommerce case study which I think is an amazing read. We already have a ton of Facebook Case Studies here at Stream SEO but none of them was targeted at eCommerce/Shopify only. If you want to contact Lucas for more info you can find more info at the end of this post. 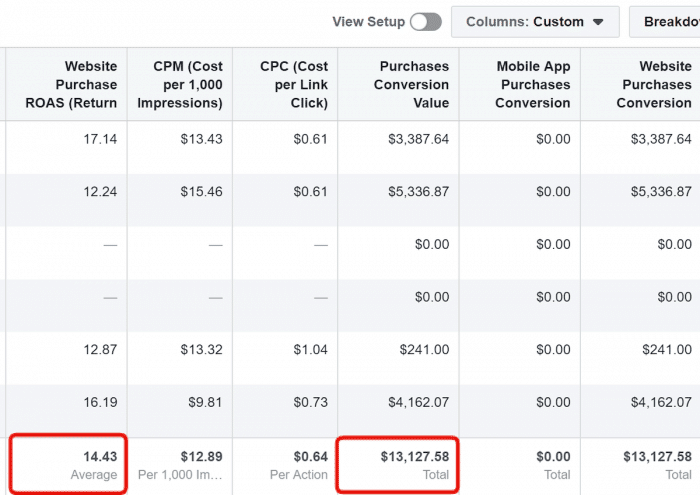 Facebook Ads is one of the most popular traffic method when it comes to eCommerce. As a result, the platform has gotten incredibly competitive nearly every niche/vertical. However, I’m here to say that Facebook Ads are most definitely not ‘dead’. In this post, I’m going to be going over a Facebook Ad campaign I ran for an eCommerce company. Over the duration of the campaign (about 4 months), it has generated over $18,700 in revenue at a 659% ROI. I’ll be going over the basics of Facebook Ads and sharing the exact framework I used on this campaign (and on nearly every campaign I create). I’ll also be showing you how you can use this framework and strategy in your own ventures, projects, or businesses to drive consistent sales and revenue. By the end, you’ll have a solid understanding of how to create profitable Facebook Ad campaigns. The very first step is to get the Facebook Pixel installed on our eCommerce store. The Facebook Pixel is a piece of tracking code which allows us to monitor and detect when website visitors take specific, important actions on our website (e.g. view a product, add a product to their cart, purchase a product, etc.). Luckily for us, most common eCommerce platforms (Shopify, WooCommerce, etc.) have built-in integrations to make installing the pixel simple and easy. With Shopify (what this client was using, and what I recommend for 99% of eCommerce businesses), it’s literally a matter of copying your pixel ID and pasting it into the field that says ‘Facebook Pixel account’ under Online Store > Preferences in your Shopify admin panel. After adding it, we can see all of the built in ‘Conversion Events’ that Shopify comes pre-built with. We can find this by clicking ‘Ads Manager’ in the top left of the Ads Manager, then clicking ‘All Tools’ and then ‘Pixels’. 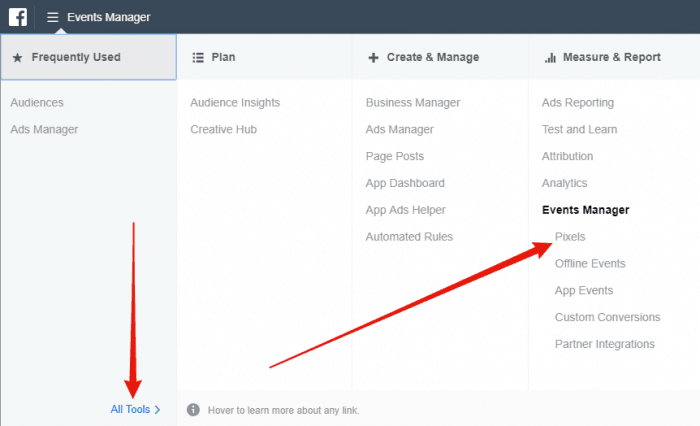 Conversion Events are specifics events that happen on your website that allow you track your campaign performance and build audiences around them. Most of these are self-explanatory, such as ‘Purchase’ and ‘AddToCart’. The only one that is a bit ambiguous (in my opinion) is ‘ViewContent’, which is simply when someone views a specific product page. When we go through the process of creating our campaigns, these Conversion Events are going to become very important. 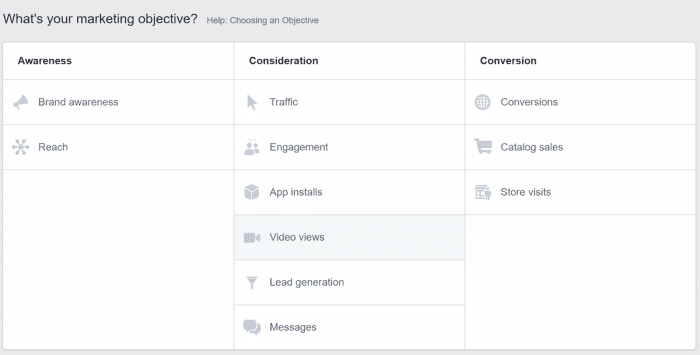 Facebook campaigns work by asking us to first choose a ‘Conversion Objective’. This is the action that you ultimately want people seeing your ad to take, in this case, purchasing our product. The Conversion Objective that you choose is incredibly important as Facebook’s algorithm is going to attempt to learn and adjust over time to find people most likely to take our desired action. 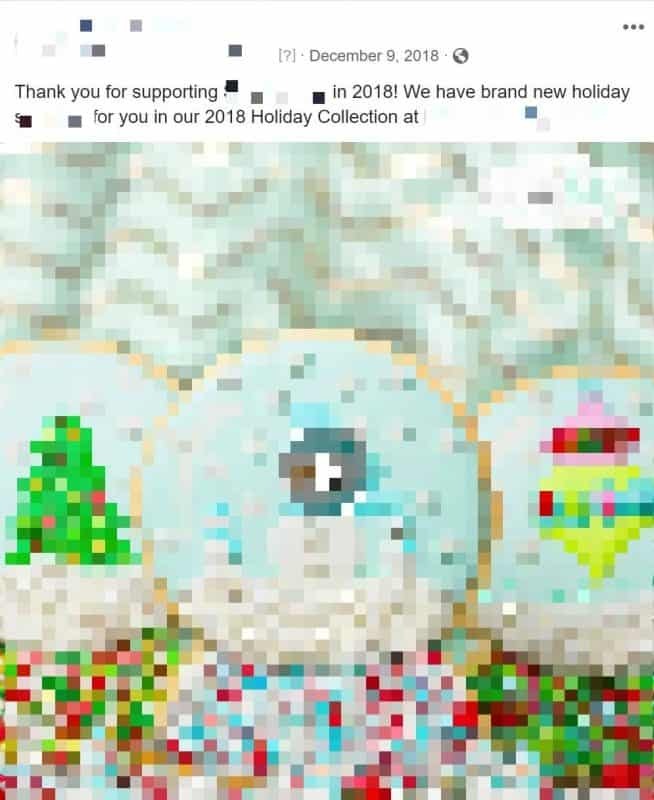 So, with a ‘Purchase’ Conversion Objective, over time Facebook will attempt to improve our campaign to show it to people most likely to purchase. This is one of the most common mistakes I see marketers and business owners make when it comes to their Facebook Ads. They select a Conversion Objective that does not actually align with their goals. For example, I see a lot of eCommerce stores using ‘Brand Awareness’ or ‘Engagement’ campaigns. While I can understand their thinking, for 99% of businesses or goal is not to build brand awareness (nor should it be, in my opinion). Your goal should be to make more money. Facebook Ads are split into 3 ‘levels’ – the Campaign Level, the Ad Set Level, and the Ad Level. As I just discussed, the objective you choose for your campaign is incredibly important. We want to select the objective that most closely resembles what action we want people to ultimately take. In some cases, this might be liking our Facebook page, or joining our email list. In this case, it’s actually purchasing our product(s). For this reason, this campaign (and the vast majority of campaigns I set up) I set up using the ‘Conversions’ objective. The Ad Set Level is where we get into the nitty-gritty of our campaign. This is where we can select what audience we wish to target, select which countries we want to show our ads in, and narrow down to specific genders, ages, and even devices. We also choose where we want our ads displayed within the Facebook ecosystem (e.g. on Instagram, messenger, etc.) as well as set the budget for our campaign. The Ad Level is where we actually write and design the ads that will be shown all over Facebook’s ecosystem. Here we can select from Facebook’s myriad of options for different ad formats (carousels, videos, single images, to name a few) as well as input our ad copy, creative, and desired landing page. A lot of marketers and business owners spend hours obsessing in tiny tweaks to copy and images. In my opinion, this is a waste of time. Changing 1 word in your headline is not going to ‘move the needle’ on your campaign performance. Changing the targeting and audience and the offer will. For this reason, I recommend you keep your ads simple, direct, and to the point. Look at what your competitors are doing and emulate them as best as possible. I call my framework for creating Facebook Ad campaigns the ‘8 Figure Framework’. Don’t let the name scare you off though – this framework can be applied to businesses of any size, even ones that are just starting out. Additionally, this framework is not exclusive to eCommerce. I’ll be giving specific examples of how each component of this framework can be applied to different business models in a variety of industries. I normally charge $1,000-$5,000+ to onboard new clients and build out their campaigns using this exact framework. It is vitally important as you read through this (and any other case study) that you keep your own projects, ventures, and businesses in mind. Think to yourself: How can I use these campaigns, strategies, and tactics to get me towards my #1 goal? And when I say ‘#1 goal’, this should be the results you actually want to get out of your Facebook Ads, and ultimately your business in general. Is it more sales? More email subscribers? More potential clients? Having your goal in mind will give you a lot more clarity (and save you tons of time + money) in helping you figure how to structure your campaigns. Don’t let vanity metrics like Instagram followers or Facebook followers distract you. Focus on the bottom line: making more money. I have worked with dozens of agencies, businesses, marketers, and entrepreneurs that overcomplicate this. And you really don’t need to. These 3 campaigns are going to the most effective, profitable campaigns you can ever run, regardless of what kind of business you run. Anything else is just going to be fluff, and is not going to get you closer towards your #1 goal and making more money. Let’s dive deeper into what each of these campaigns entails. Retargeting, also sometimes called remarketing, is the process of advertising to people that have already interacted with you/your business in some way. Retargeting is going to be your main driver of consistent ROI. This is because it is 5-10x easier to get someone to purchase/complete a desired action when they have previous history with you or your business. 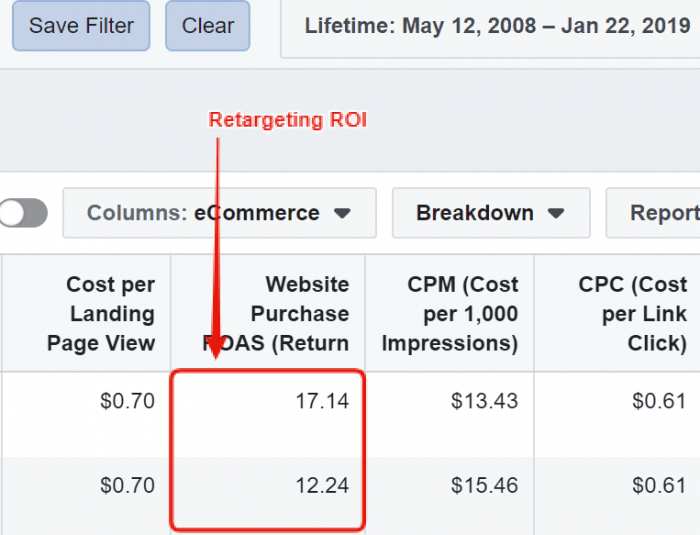 On retargeting campaigns, it is not uncommon to see ROAS (return on ad spends) in the 5-10x+ range. Artist: Retargeting website visitors with their new album/project/etc. These are just a few basic examples. In this specific campaign, I used retargeting to show ads to people that had either 1. Added an item to their cart and didn’t purchase it (abandoned cart), or 2. Viewed a specific product but never purchased it. 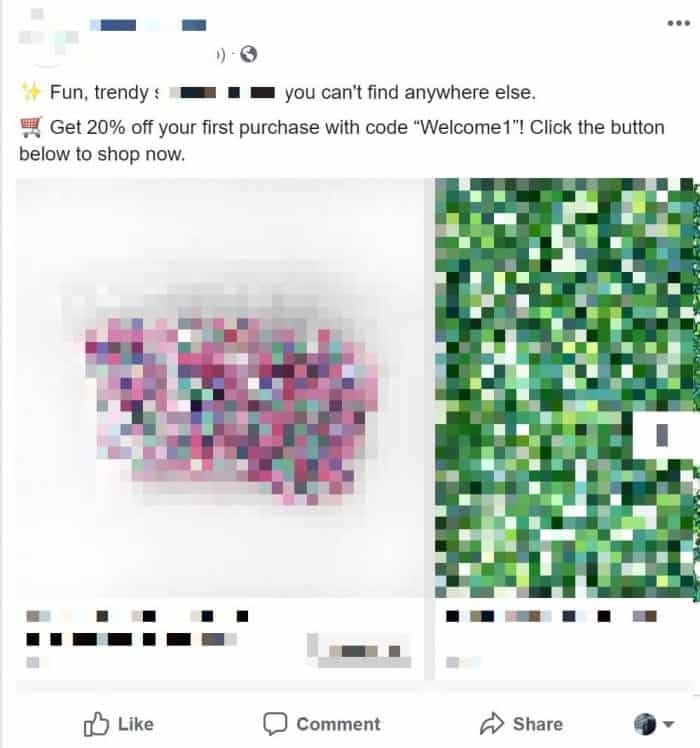 Using Facebook’s Dynamic Product Ads technology allowed me to show the exact products to people that they had abandoned in their cart, or had viewed. So, if someone had added a Purple Widget to their cart, the ad would display the Purple Widget in their carousel. To get this set up, we need to create what’s called a ‘Catalog’ within Facebook. 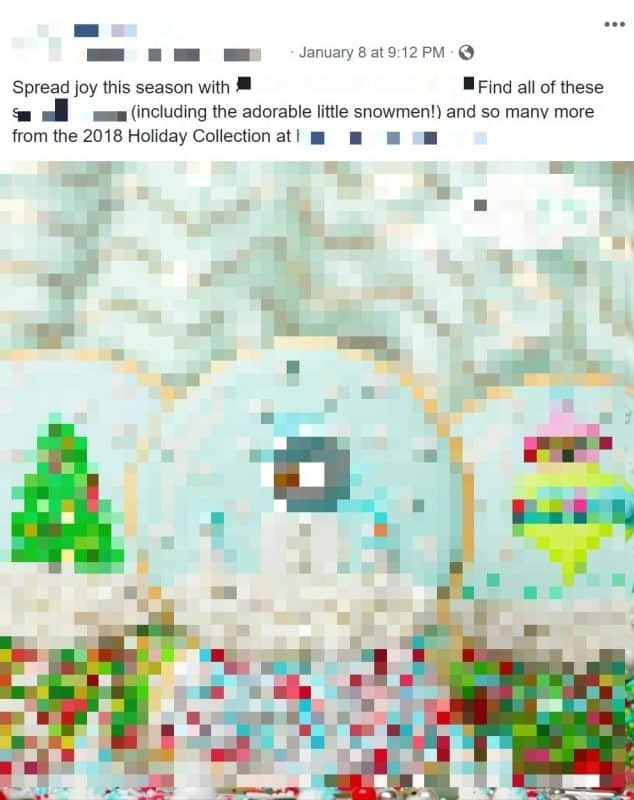 This is essentially giving Facebook access to all of our store’s data so it can dynamically display them to people within ads. Getting this set up is pretty simple with Shopify. I used a plugin called Flexify, which creates a .csv file of every product on your store. Then, you would go to Ads Manager > All Tools > Catalogs and import it. The ads we used for the retargeting campaign we’re also quite simple. As mentioned, used Facebook’s DPA format to create a carousel of products they interacted with. Our copy was also fairly simple. We offered a 20% discount coupon to encourage shoppers to complete their purchase, which worked quite well. 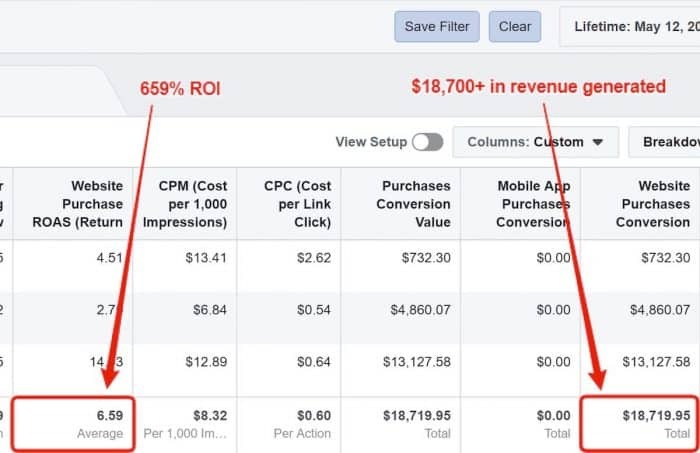 Using these strategies and techniques, the retargeting ad sets for this campaign generated $13,127.57 in revenue at a 1,443% ROI. Your previous customers are the biggest gold mine for your business that you are likely not using. Think about it: these are people that have already gone through the process of pulling out their wallet and purchasing something from you. Getting them over that ‘buying hump’ again is infinitely easier than finding brand new customers. All you have to do is show them other products/services you offer and that they might be interested in. And just like retargeting, these campaigns are also massive drivers of ROI when done correctly. Now, this is process is pretty obvious for an eCommerce store. All you have to do is show them some of your other best-selling products. However, for businesses that don’t sell lots of products, this can be a bit trickier to figure out. If your business only sells 1 product/service or service (or none at all), the easiest way to do this is by upselling/cross-selling through affiliate partnerships. The idea is simple: find a company that offers a complementary product or service to your businesses and promote it to your audience. For example, a woodworking blog might not have any products or services to promote. But they could partner with a tools manufacturer to promote their products. These campaigns work surprisingly well, and can be applied to nearly any business/business model. Hopefully this gives you a good idea of how you can use post purchase upselling/cross-selling, even if your business doesn’t sell multiple products/services (or any at all). For this specific campaign, I set up campaigns upselling their newest products. In the ad copy, I made sure to call out these previous customers, thanking them for their support in 2018. With this super-simple strategy, the upselling campaign generated $732.30 in revenue at a 451% ROI. New Customer Prospecting refers to finding new people to interact with and engage with your business. This might be in the form of getting new email list subscribers, driving new purchases, getting new free trial signups, getting webinar attendees, etc. Regardless of what business you are in, you need new users, leads, and/or customers to grow. The best way to find these new users, leads, and/or customers is by leveraging Lookalike Audiences. Lookalike Audiences work by feeding Facebook a ‘source’ audience, that it’s algorithm then scans for commonalities and attempts to find people most similar to them. 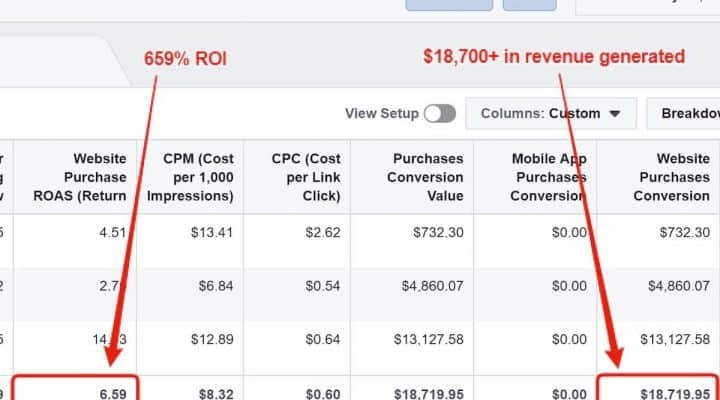 The most common method of creating Facebook Ads is to create as large a list as possible of your previous users and customers and feed it into Facebook. However, in my experience I have found that quality outperforms quality when it comes to Lookalike Audiences. In fact, I was told by a Facebook engineer personally that Lookalike Audiences perform best in the 1,000-4,000 range. Creating a list of all of our repeat customers. These were people that purchased 2 or more times from us in the last 6 months. List 1 came out to around ~1,900 people and List 2 came out to around 1,100. Right in the range we were looking for! Note: This strategy is the ideal setup for businesses that have high traffic and existing data. For new and growing businesses, you might not have enough data to segment down to specific audiences of this size. For this reason, you will unfortunately have to scrape up as much data as you can to get within the 1,000-4,000 range. These 2 strategies allowed to achieve much higher ROIs than if we had simply used all of our previous customer data. By segmenting down to our ‘best’ customers, we were able to get more cost-efficient purchases and higher order values, thus resulting in higher ROIs. It’s vital to understand that your ROI/results from new customer prospecting is going to inherently be worse than from retargeting and previous customers/users. Getting someone who’s never heard of you or your business to buy from you/give you their email/sign up. 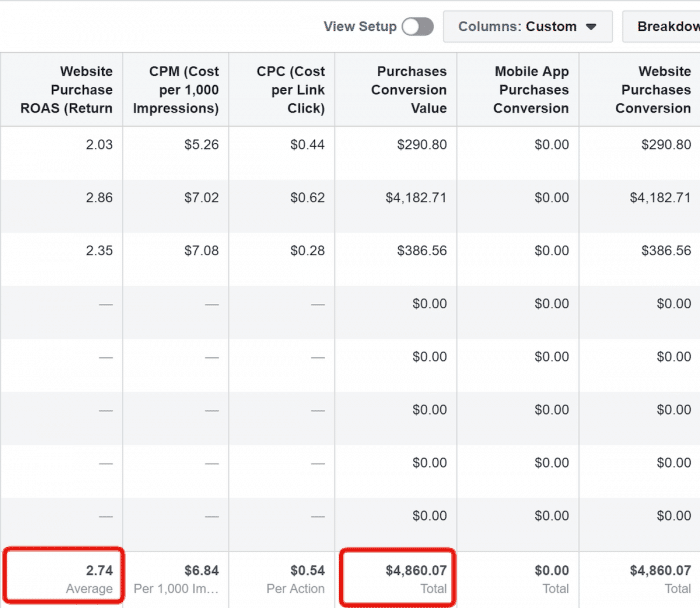 This is generally where most business owners struggle the most with when it comes to Facebook Ads. And who can blame them? Getting random people on the Internet to pay attention to you, much less buy from you, is extremely difficult! For this specific business, our new customer prospecting campaigns were designed to showcase our best selling products in simple, clean ad formats. Our best performers were actually simple slideshow videos, which you can make within Facebook by just uploading images. By targeting only our best customers, the new customer prospecting campaign generated $4,860.07 in revenue at a 274% ROI. I hope you have found this post beneficial for you and will help give you some news ideas on how you can use Facebook Ads to grow your business and make more money, whether you’re in eCommerce or another industry. Hopefully you enjoyed this Facebook eCommerce Case Study. Please share it with people who might be interested. Lucas Lee-Tyson has been into Internet Marketing since he was 15. Today, he is the owner of Growth Cave, a place where marketers and entrepreneurs alike can learn how to create and manage their own profitable Facebook Ad campaigns. You can also find him on Twitter. I have always followed this blog and I think this is high time I started applying all these tutorials here and hope to make a better income with business advertising. Let us know if you have some questions about the article. Servando, das clase sobre fb ads? o cuanto cuestan tus servicios?. He conseguido exclusividad de un producto que deja entre 50 a 100 dolares por venta, sin problemas de envío por ser pequeño, mucha gente lo necesita, ya tengo datos de cuales son los 10 productos más vendidos, o sea tengo todo para hacer una buena cantidad de dinero pero la parte de fb ads me está costando. Ya tengo bastante conocimiento con fb ads pero en otras areas no tanto con ecommerce. No doy clases o servicios de FB Ads. Cual es la parte que te está costando? alguna duda en específico? Hola Servando, creo que de momento encontrar los intereses más apropiados para tener un costo más bajo por resultados.